One day, I was walking in the mall with my toddler, Brandon, beside me who's holding on to the side of the stroller. He looked a bit awkward and I was trying so careful and making sure he wasn't too close to the stroller wheels. I thought to myself that there's got to be a product that my toddler can hang on to and be close by my side. I've seen kids with little back packs and a strap attached, but thought those would be expensive and didn't want to get them. Then I discovered the Tag*a*Long created by Naptime Indistries, LLC. I was given the opportunity to review their product. What's a tag*a*long? 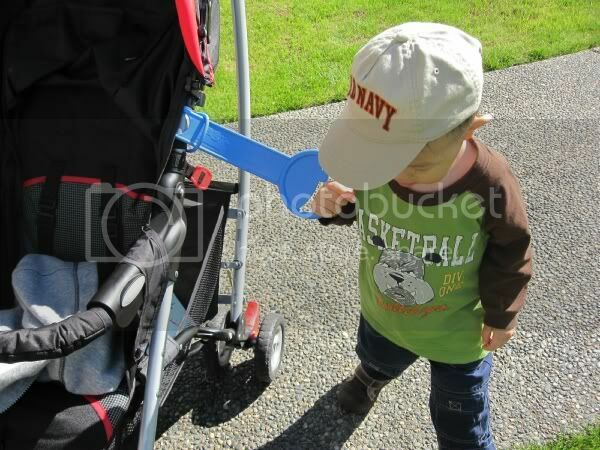 It is a fun way for kids to walk comfortably next to a stroller and keep them close to you. The tag*a*long gives those kids a place to hold while moving about and a place to come back to when the fun is done. 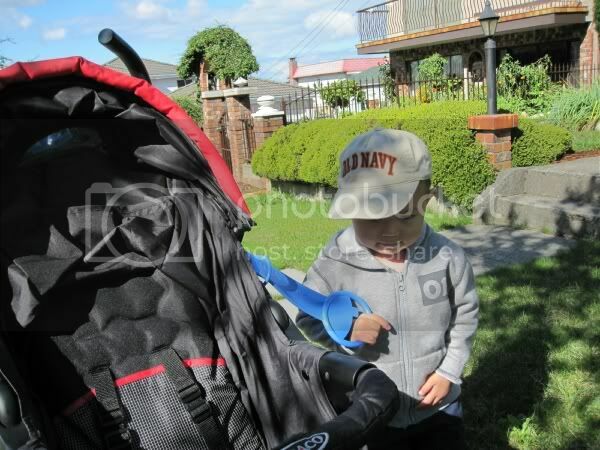 Brandon actually likes holding on to the tag*a*long while walking with the stroller when he doesn't want to sit in it. 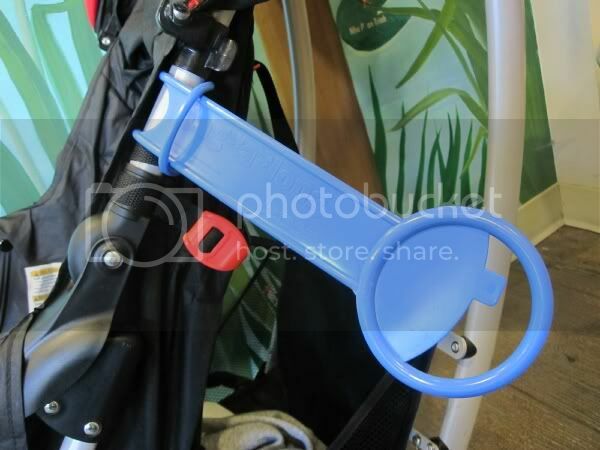 To my surprise, he would occasionally ask where the "blue handle" is and wants to hold it while walking along with me when I'm pushing the stroller. Though the reads that the recommended age for use is 3 and up (Brandon is 2), it was useful for me and Brandon. He already figured out what it was used for when I told him it was for him to hold if he wants to walk. Every time Brandon holds on to the tag*a*long attached to our stroller and while walking to Frog Hollow Neighborhood house for the family drop-ins, parents would tell me that it's such a great idea. Even strangers walking along the street or at the mall would comment that it is neat and it is a great idea. Brandon was being a good boy too! One time, I had a lady (a mom) asked me where I got it. I happened to have that product card with me that has the website name and I gave it to her. Here's just a short clip in action of Brandon holding on the tag*a*long. The products are available for purchase directly through their online store or on Amazon.com. If you like to win it, one (1) lucky reader will have a chance to win one tag*a*long of their choice of color. Chosen winner will be selected via Random.org. 1) Visit their website at http://www.tagalongkids.com and tell me in the comment below which is your favorite color of the 4 available. Disclosure: I received the Tag*a*long product at no charge in exchange for a review of my opinion. Thanks to Tag*a*Long Kids and Naptime Industries. The opinions expressed are my own personal and honest thoughts. No other compensation was given. found you on mom blogger club so I decided to follow and enter. This tag-a-long is smart. May have to get one when we have our second child. We don't have sidewalks and this will help keep our oldest from wandering when we go to the park.